Biomass is a very broad term; this section addresses one form of biomass: wood products. These can be in the form of firewood, bark and wood chips from the forests, and as remnants of the wood processing industry compressed into pellets. Modern wood-fired boilers offer a high degree of automation, operational safety, and low noise and dust production. The environmental advantage of biomass is clearly that it is simply completing the natural cycle, from vegetation growth through decay and returning to the growth cycle. Burning biomass simply accelerates this degradation process, producing no more CO2 than would occur by decomposition. One issue can be raised: whether the ash after combustion finds its way back to the forest floor. Firewood is an ancient and sustainable fuel source for keeping a shelter warm. During the last decade, remarkable improvements have been made in wood stove performance regarding both efficiency and emissions. Such stoves typically include a heat exchanger coupled to buffer storage. Unfortunately, there is only a small choice of products with the small heating capacity (< 5 kW) needed by highperformance housing. Figure 12.5.1 shows one example system that can operate at very low heating power because the firewood is placed vertically in the oven. Subsidies for woodstoves are rare to non-existent compared to other biomass solutions. The living quality that a wood fire brings to a home is, however, often decisive. Pellet ovens can be room units or central units located, for example, in the basement. Figure 12.5.2a illustrates a central heating system using a pellet-fired boiler and variations of pellet storage. 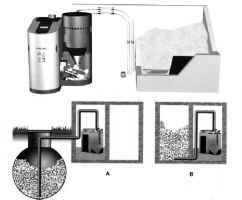 A combined water storage, pellet burner and integrated pellet storage is shown in Figure 12.5.2b. A high efficiency with minimized emissions is achieved even when the heat demand of the building is 30 per cent below the peak demand when a 'stop and go' operation occurs. The frequencies of startups can be minimized by a buffer store. Ideally, in summer, heat demand for DHW should be almost entirely provided by a solar thermal system. This is an ideal system for high-performance housing striving for sustainability. The life-cycle costs of pellet heating are comparable with those of an oil burner system today. The use of wood in the form of pellets instead of firewood facilitates the automation of the fuel supply to the boiler. The wood in this form burns more efficiently and cleanly. Mass production of pellet boilers has reduced their costs. The pellets are produced from sawdust under high pressure and without input of chemical products (binder). The 100 per cent natural wood pellets are transported in a tank lorry and pumped dust free into a storage bin link with a feeder to the boiler (see Figure 12.5.3). 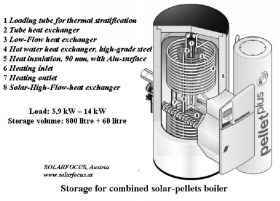 New on the market are storage-integrated pellet burners. Such systems are already cost competitive in regions where pellets or chips from forest residues are available. Nevertheless, these systems have an economically limited radius from wood-fuel distributors; in Austria, the maximum radius is considered to be about 80 km. 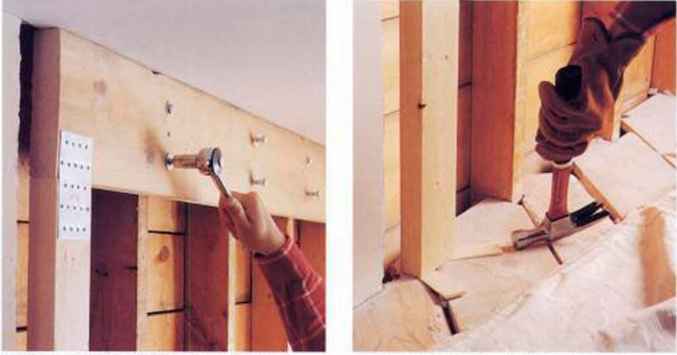 Because high-performance houses need so little heat, a community wood-fired system can improve the economics of wood-fired heat production by sharing the overhead costs (see Figure 12.5.4). There are practical problems, however. During the non-heating season, the demand for heating DHW from the district heating is very small relative to the pumping power and distribution energy losses. The boilers are also oversized for only hot water production and are therefore operated inefficiently. This problem can be alleviated if the domestic water heating demand is primarily covered by a solar thermal system. Source: AEE-INTEC, Gleisdorf, www.aee.at _Figure 12.5.3 Wood pellet transport individual tanks it is possible to operate the network at a lower temperature for space heating (< 40°C) and a higher temperature for hot water preparation (about 65°C to 70°C). Network heat losses are thus smaller than is the case with networks with heat exchangers that must operate at maximum temperature all of the time. On the other hand, multiple decentralized storage tanks cost collectively more than just decentralized heat exchangers. 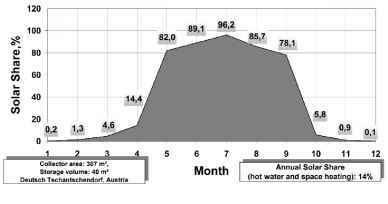 The seasonal performance of a solar-supported wood-fired district heating system in Tschantschendorf, Austria, is illustrated in Figure 12.5.5. Outside the heating season, solar collectors supply sufficient heat to the storage tank to cover the demand for three to five days. Although the annual solar coverage for space heating and hot water preparation is only about 14 per cent, during the non-heating season the solar system covers more than 80 per cent of the demand! In summary, wood-fired district heating plants are most efficient when the system is shared by many users (high demand density). The distribution heat losses can be minimized by rational housing estate plans, highest quality pipe insulation and lowest possible return temperatures (< 40°C during non-heating months). The recharging strategy of the boiler should optimize the contribution of solar collectors.